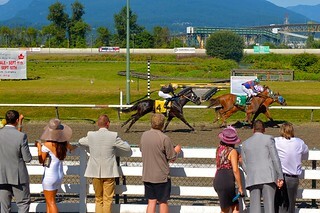 Deighton Cup weekend's 4th annual Thoroughbred: A Day at the Races gala event at Hastings Racecourse on August 12, 2012. 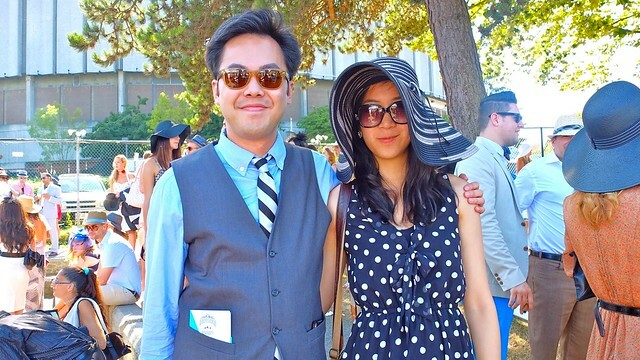 I always look forward to a good, fancy, outdoor summer party where dressing to the nines is expected. 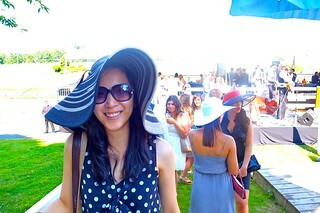 It was another weekend of high class fun and horse racing. 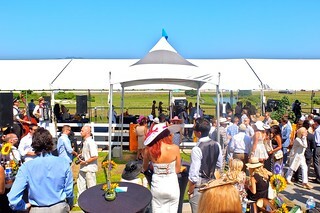 This year's Thoroughbred event was a upgraded to "A Weekend at the Races", amping up the festivities with more theatrics. Saturday afternoon was filled with friendly faces like my good buddy Peter Verge from Shaw TV. 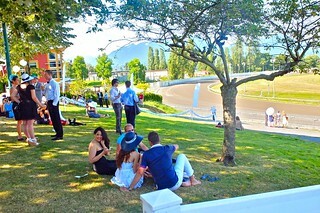 We enjoyed some fine horse racing action from the VIP tent and lounge. 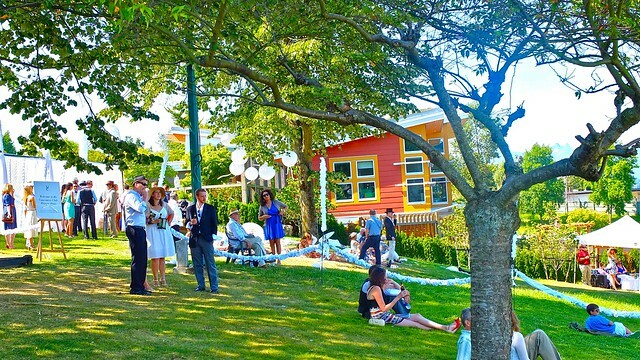 It was a bright, scorching summer's day as we searched for refuge in a shady, grassy knoll escape overlooking the festivities with my big-hatted partner in crime Janice. 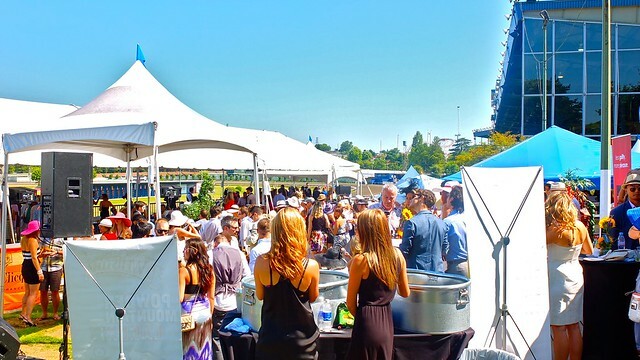 The tents and entertainment zones filled up to the brim with fancy pants folks looking to soak in a few finer points of living at this gala event. Left: Peter, Vancouver Urban Winery's Steve Thorp, and Colt Manson showing off their yellow My Pakage Underwear. Middle: Vancity Buzz's Crystal Kwon and PR gal Liberty Lee posing. Right: Naja A. Kader smoking a cigar like a boss. 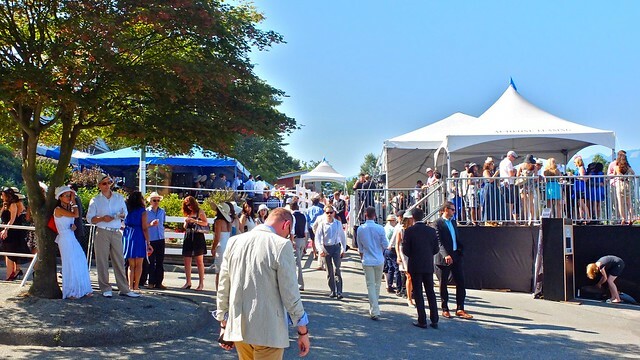 I'm endeared and delighted by this annual tradition of enjoying horsies in the summertime adding cigars, cocktails, fashion, and high culture at the race track into the mix. 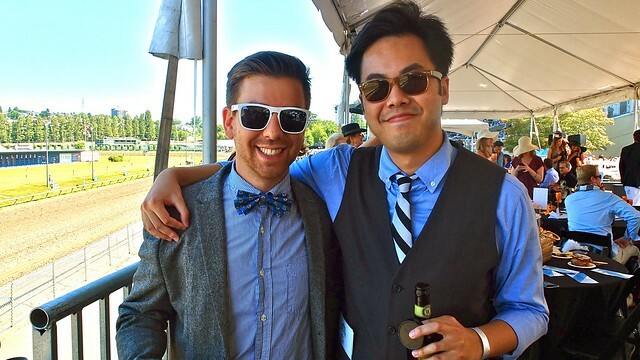 It's a fun combination of class and style.